As a child growing up in St. Louis, Missouri, I was utterly fascinated by foreign languages and cultures. I would continuously fantasize about life in other countries and covertly follow any person speaking a foreign language around town for as long as I could. This childhood interest (and slight stalking tendency) eventually turned into getting my Master’s Degree in the German language at Bowling Green State University, a two-year program with the first year in Salzburg, Austria, and the second year in the not-as-glamorous Bowling Green, Ohio. Not glamorous, perhaps, but the town where I would meet my future – and, perhaps not so surprising to you – foreign – husband. My future husband was from a small town near Salzburg, although we had never met when I was there the year before. He was studying abroad in Bowling Green, and we met at the German Department’s Oktoberfest (too cliché?) through a mutual Austrian friend. After I graduated, we both moved back to Austria, me to teach English with the Fulbright program and him to get his Master’s Degree in computer science. 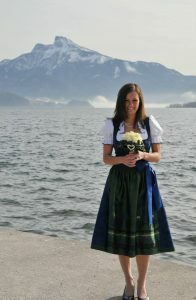 We lived in Austria for the next three years, one of which included our Austrian wedding in the beautiful town of Mondsee. In 2014, we decided to move back stateside, had a big American wedding (doesn’t everyone get married to the same person twice? ), and eventually ended up in Boston, Massachusetts, where I am a German-English translator and he is a software consultant. 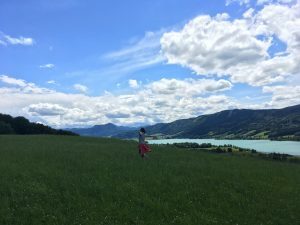 After years of telling my family and friends the hilarious things my husband had said, his misunderstandings of American idioms, great English mistakes and amusing cultural observations, they finally convinced me to start a blog. Between the two of us, we have both lived for years as a foreigner in the other’s country, grappled with the other’s language and struggled with understanding the other’s habits and customs. Merging two lives can be hard for any couple, but throw two completely different cultures in the mix and you get scenarios you would never have dreamed of. This blog will be just that – funny (and sometimes embarrassing!) 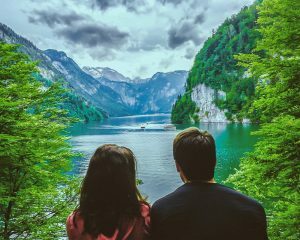 stories of our language mistakes, of culture shock for me in Austria and for him in America, and of trying to merge our Austrian and American cultures together in a way that somehow, possibly, maybe works. Thank you for reading!